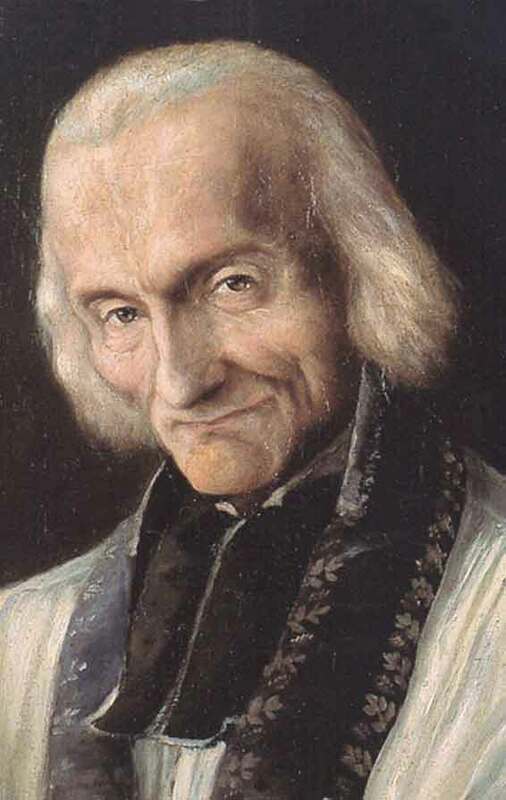 This selection below comes from a sermon given by the Patron Saint of Parish Priests, Jean Marie Vianney, (pictured above) also known as the Curé of Ars, in the village of Ars in France. Born in 1786 in Darilly, a small town near Lyons, St. Jean Vianney felt called to the Priesthood from a very young age. Although he had much difficulty in his studies and in passing his examinations to the seminary, through his perseverance he was ordained to the priesthood in 1815. He was assigned to the town of Ars, with a population of about only 200, in 1818. This was to be his parish until his death in 1859. When he arrived there the people were somewhat lax in their religious practices. The excerpts from two of his early sermons below show he clearly had a way to increase their fervor! He gave his parishioners many doses of “tough love” speaking out against drinking, dancing, cursing, immodesty in dress and speech, and working on Sundays, among other things. He particularly felt that the town's taverns and cabarets, although quite popular, were occasions of sin. While such concerns about dancing in particular might strike us today as being severe, they reflect the pious beliefs of a priest lovingly dedicated to saving souls! Fr. Vianney was particularly concerned that his flock thought too much of their own needs and pleasures rather than those of others, that they were too self-centered rather than Christ-centered. His simple but straightforward style paid off over time. Through Fr. Vianney’s preaching about God's justice, goodness and mercy, the people of Ars increased in holiness. It has been said that the Curé (a French term for parish priest) transformed his parish from one of the worst in the diocese to a shining success that drew to it tens of thousands of pilgrims each year from all over the world during his lifetime. Even today over 500,000 come each year. This also was due in no small part to Fr. Vianney's humility, holiness, apostolic zeal, and his extraordinary ability to "read" the souls of many of those who flocked to him for confession. He could spend as much as 18 hours a day in the confessional! While Fr. Vianney was indeed humble, he was no pushover in the realm of spiritual combat with the Evil One! Satan periodically harassed the Curé for much of his priesthood, from about 1824 on. At times, Fr. Vianney. would hear the curtains of his bedstead rattling, as if there were rats there, (which they’re weren’t)! At other times one could hear loud noises or even shouting, as if there were thieves stalking his residence. All this commotion came from the Devil, Satan, or as Fr. Vianney called him “Le Grappin” (the pitchfork). One time his bed even caught on fire when no one was in his room! His weapons against these assaults were prayer, patience, and his incredible devotion to God! While at times the Devil's harassment did leave the Curé weary, he continued his work ministering to his flock and helping to save souls, especially in the sacrament of penance (confession). Not that he didn’t have his own internal struggles from time to time. He tried to leave Ars three separate times during his priesthood out of a craving for solitude and feelings of unworthiness before God, yet each time he came back to his parish when he realized this was where God wanted and needed him to be! These excerpts from a couple of Fr. Vianney's sermons on prayer below, (with titles taken from their published versions) date from early in his time at Ars. They reveal both his frankness in preaching to his flock, as well as his steadfast desire to see them victorious in their own spiritual combats so as to avoid Hell and share Eternal Life with our Lord in heaven! My dear brethren, not only is prayer very efficacious, but, even more, it is of the utmost necessity for overcoming the enemies of our salvation. Look at all the saints: they were not content with watching and fighting to overcome the enemies of their salvation and with keeping well away from all that could offer temptation to them. They passed their whole lives in prayer, not only the day, but every often the whole night. Yes, my dear children, we will watch ourselves and all the motions of our hearts in vain, in vain we will avoid temptation if we do not pray; if we do not have continual recourse to prayer, all our other ways will be of no use at all to us and we shall be overcome. We can see plainly that in the world there are a great many occasions when we cannot run away; for example, a child cannot run away from the society of his parents because of their bad example. But he can pray, and his prayer will sustain him. Even supposing that we could run away from people who give us bad example, we cannot run away from ourselves, who are our biggest enemy. If our Lord does not watch over our preservation, all of our efforts will come to nothing. No, my children, we shall not find any sinner who may be converted who has not recourse to prayer, not one who will persevere without having very great recourse to prayer, and we shall never find a Christian damned whose downfall did not commence with a lack of prayer. We can see too how much the Devil fears those who pray, since there is no moment of the day when he tempts us more than at prayer. He does everything he possibly can to prevent us from praying. When the Devil wants to make someone lose his soul, he starts out by inspiring in him a profound distaste for prayer. However good a Christian he may be, if the Devil succeeds in making him either say his prayers badly or neglect then altogether, he is certain to have him for himself. If you wish to understand this even better, consider since when you have been unable to resist whatever temptations the Devil put in your way and since when you have left the door of your hearts open to the four winds-is it not because you became careless with your prayer, or have been saying them from habit, by routine only, or just to get rid of them and not to please God? Yes, my dear brethren, from the moment that we neglect them, we move with big steps towards Hell: we shall never return to God if we do not have recourse to prayer. Yes, my dear children, with a prayer well said, we can command Heaven and earth and all will obey us. We can only find our happiness on earth in loving God, and we can only love Him in prayer to Him. We see that Jesus Christ, to encourage us often to have recourse to Him through prayer, promises never to refuse us anything if we pray for it as we should. But there is no need to go looking for elaborate and roundabout ways of show you that we should pray often, for you only have to open your catechism and you will see there that the duty of every good Christian is to pray morning and evening and often during the day—that is to say, always…. Which of us, my dear brethren, could, without tears of compassion, listen to those poor Christians who dare to say that they have not time to pray? You have not the time! Poor blind creatures, which is the more precise action: to strive to please God and to save your soul, or to go out to feed your animals in the stable or to call your children or your servants in order to send them out to till the earth or tidy up the stable? Dear God! How blind man is!... You have not the time! But tell me, ungrateful creatures, if God had called you to die that night, would you have exerted yourselves? If He had sent you three or four months of illness, would you have exerted yourselves? You must get on with your work, you say. That, my dear people, is where you are greatly mistaken. You have no other work to do except to please God and to save your souls. All the rest is not your work. If you do not do it, others will, but if you lose your soul, who will save it?